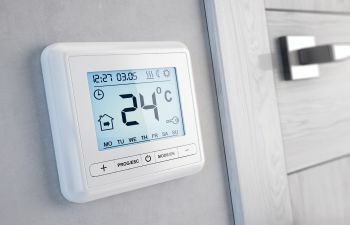 Allowing occupants to control their HVAC unit while they are away, programmable thermostats help cut spending with settings for particular rooms or spaces. Homeowners can even adjust their thermostat to begin cooling shortly before they arrive home from work, so as not to waste energy cooling the home throughout the day when no one is home. To further maximize the efficiency of an HVAC unit, changing air filters monthly (as opposed to quarterly) during hot, summer months helps prevent a disruption of the airflow that might cause the unit to work harder to provide cooling. Similarly, it’s important to make sure that air vents are open and clean. In some cases, air vents are accidentally closed and never re-opened, especially when a room is cleaned. In turn, a clean air vent will prevent dust and debris from entering a home or commercial space. Finally, for multi-level homes or businesses, you might notice that the upper levels are warmer than the lower ones. This is simply because heat rises. In this case, ceiling fans or standing fans help circulate the air and push warm air out. Most importantly, this helps the HVAC unit work less. If air filters have been replaced and vents are open and clean, and there continues to be warmer areas in a home, it’s wise to take a look at the outside unit. For example, if there is heavy shrubbery or a tree hanging over the unit, there’s a good chance that debris or even branches could have gotten into the unit. Without question, this can hinder airflow, and may lead to further damage. Given the above-mentioned accessories and tips, if your HVAC system appears to be maxed out, it might be time to invest in a newer, more energy-efficient model. Though the initial costs might seem steep, manufacturers with high energy star products use up to 50% less energy than previous brands. This makes for huge savings in the long run. Stay Cool And Comfortable Without Emptying Your Wallet! As industry specialists, the technicians at ClimateSmith, LLC understand that when it comes to heating and cooling your space, cost matters. That’s why we offer premium HVAC accessories and expert tips to help you stay cool and comfortable, without emptying your wallet. Call ClimateSmith, LLC today to learn more!